← As ‘frack hits’ grew in Alberta, regulator (AER) takes action, but years too late; high pressure frac hits have been damaging hydrocarbon wells for at least a decade! The traditional hazard maps, predicting the risk of natural quakes, are expected to be issued early next year. The map evaluating the risks of man-made quakes will be issued later in the year because the agency is still figuring out how it should be assembled. 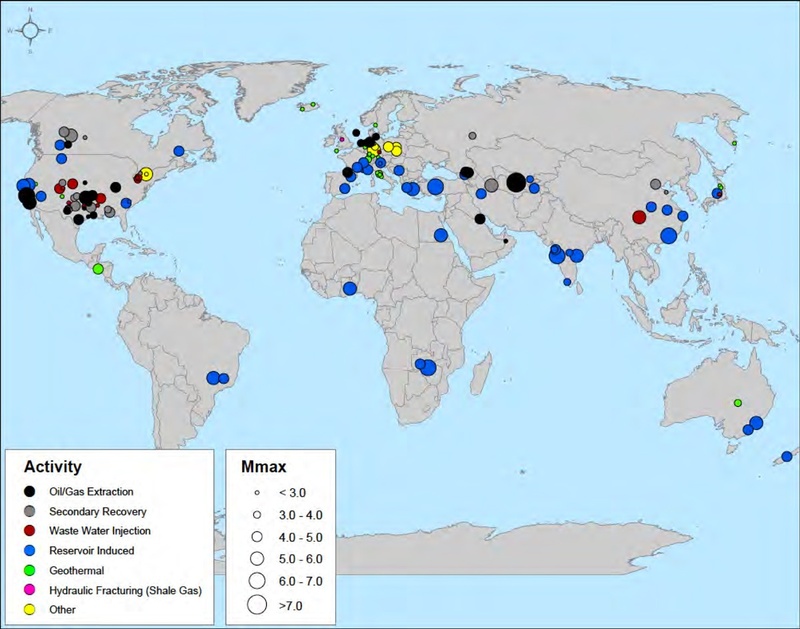 Locations of earthquakes linked by scientists to human activity as of last year. … Map courtesy of the National Research Council. [Sneaky buggers! The 272 earthquakes found by Canadian regulators to have been directly caused by hydraulic fracturing, officially reported in August 2012, are excluded, as well as the many caused by frac’ing in the USA to mid-2011, long before this map was created. Why are only the quakes caused by Cuadrilla in the UK included on the map? The traditional map of natural earthquakes is intended to guide decisions by architects, builders and others for as long as 50 years. The danger from man-made quakes might be much shorter than that, particularly if the activity causing it stops. Still, man-made earthquakes are a hazard. Two people were injured and 14 homes were destroyed in a November 2011 quake outside Oklahoma City that USGS researchers have linked to deep underground injection of oil and gas wastewater (EnergyWire, March 27). The amount of such deep injection has grown sharply with the nation’s shale drilling boom, which has been driven by a hydraulic fracturing process that uses far more water than conventional drilling and creates far more wastewater. Most of that wastewater is eventually injected underground. Geologists have known for decades that injection of any kind of industrial fluid deep underground can cause earthquakes. Injection of toxic fluid at the Rocky Mountain Arsenal was blamed for earthquakes near Denver in the 1960s. Amid the boom in drilling, fracking and injecting, USGS scientists have identified a “remarkable” spate of earthquakes in the middle of the country. The agency says the rash of quakes is probably linked to human activity. At the center of that trend is Oklahoma, which has one of the densest inventories of drilling wastewater disposal wells in the country. Oklahoma has ranked No. 2 among the lower 48 states for earthquakes both this year and last, after California. Since the beginning of 2009, 10 percent of the earthquakes in the country have been in Oklahoma (EnergyWire, Dec. 2). In October, USGS declared that central Oklahoma is in the midst of a seismic “swarm.” That prompted the state’s insurance commissioner to urge people in the state to buy earthquake insurance. Texas, which has probably the largest number of injection wells, had 18 earthquakes of magnitude 3 or greater from 2000 to 2008. This year alone, it has had 16. USGS and other researchers have also identified “induced” or “triggered” quakes in Arkansas, Colorado and Ohio. The man-made quakes have become more severe and more common since USGS issued its last set of earthquake hazard maps about six years ago. Previously, induced seismicity fell into a “gray area,” said Mark Petersen, national regional coordinator of the USGS Earthquake Hazards Program. They were often excluded, but sometimes they were left in if they were thought to be a risk. … When the last set of earthquake maps came out in 2008, eight areas were excluded because shaking in the regions was traced to industrial activities. In next year’s model, that number is expected to be about 20. The 2011 Oklahoma quake, magnitude 5.7, is likely to be left out of the traditional evaluation of natural quake risks, along with another damaging magnitude-5.3 quake a few months earlier in Colorado. Other seismic events that would be evaluated in the new model include the Guy-Greenbrier earthquake swarm in central Arkansas in 2010, a series of earthquakes near Dallas-Fort Worth in 2009 and shaking since 2006 near the West Texas city of Snyder that has been linked to carbon-dioxide injection. As they evaluate the risk to the public, scientists and others might look at whether the activity causing the earthquakes is likely to end quickly or whether the shaking is likely to become the “new normal,” said Justin Rubinstein, a research geophysicist at USGS who is working on how to use the data from man-made earthquakes. January 7, 2014, Texas Railroad Commission hires seismologist because of dramatic surge in oil and gas industry caused quakes A key state agency announced Tuesday it is hiring a seismologist, part of an effort to tackle a sudden increase in earthquakes in areas with significant oil and gas drilling activities. The Railroad Commission, which regulates drilling statewide, said the move came after a public meeting last week in Azle, a town frequently rattled of late by earthquakes, about 50 miles northwest of Dallas. The Railroad Commission of Texas seeks a seismologist capable of utilizing United States Geological Services (USGS), National Earthquake Information Center (NEIC), and other sources of seismic information to evaluate the projected epicenters of seismic events in Texas relative to all potential sources of origin. · Coordinating with academic experts studying seismic events in Texas. · Obtaining, studying, and interpreting various forms of data to evaluate seismic activity associated with known faults and historic and/or ongoing oil and gas exploration and production activities. · Leading efforts to conduct research as well as internally integrate oil and gas science with seismic science. · Coordinating communications and information gathering with various stakeholders. · Reviewing, analyzing, interpreting, and commenting on technical data from seismic data sources, computer models and digital maps. · Developing calculations, estimates, recommendations and action plans. · Presenting information in layman’s terms to an audience through presentations and in writing to the public, to industry, to Commissioners, Commission staff, and the Legislature. · Maintaining relationships with internal and external customers. · Attending meetings in the scientific community to learn and gather relevant information. · Planning, assigning and supervising the work of others in a work group. · Performing additional duties as assigned. · Performing work with considerable latitude for the use of initiative and independent judgment. · Graduation from an accredited four year college or university with a bachelor’s degree in the Geosciences, seismology, physics, chemistry, advanced mathematics or a closely related field. · Preference will be given to candidates with an advanced degree in one of these fields or a closely related field. · A minimum of five (5) years of progressively responsible experience in positions involving the study of seismic activity. · Demonstrated experience in the analysis and evaluation of technical data. · Demonstrated experience in a supervisory or management role. · Demonstrated experience with input ground motions for seismic design preferred. · Demonstrated experience in digital signal processing preferred. · Ability to demonstrate knowledge of geosciences principles, techniques, and procedures; of mathematics and statistics; and of the practical application of geosciences and technology. · Knowledge of seismic data acquisition methods and systems. · Knowledge of the principles and contemporary practices of public administration and management. · Knowledge of oil and gas regulatory functions is helpful. · Skill in data collection, analysis and management of geological, geohydrological, and geophysical data. · Proficient skill in performing statistical analyses. · Skill in applying modeling and statistical procedures. · Skill in exercising logic and sound reasoning to identify the strengths and weaknesses of alternative solutions, conclusions, or approaches to problems. · Skill in forming and maintaining positive and productive working relationships both internally and external to the Commission including with other state/public agencies, internal work teams, and state/federal oversight agencies. Microsoft Word, Excel, PowerPoint, Access and Outlook. · Skill in handling multiple priorities efficiently. · Skill in oral and written communication with the ability to present material to an audience. · Skill in demonstrating attention to detail and accuracy of information. · Ability to learn, understand, and interpret oil and gas policies and procedure. · Ability to conduct inspections. · Ability to apply geological concepts. · Ability to establish and maintain trust and credibility with management, colleagues and direct reports. · Ability to prepare reports, memos, calculations and other documentation. · Ability to maintain confidentiality of information. · Ability to work as a member of a team. · Ability to maintain a professional demeanor in any situation. · Ability to reach high and low; open, close and retrieve files from file cabinets; and lift and/or carry equipment up to 25 pounds. Professional registration as an engineer, geologist, geophysicist, or closely related field preferred. Travel is up to 20%. Salary is up to $8248/month. One (1) vacancy exists for this position. THE RAILROAD COMMISSION OF TEXAS ONLY ACCEPTS ONLINE APPLICATIONS FOR THIS POSTING. Applications, for this posting, should be submitted on-line by clicking on the ‘Apply’ link above. Due to the high volume of applications we do not accept telephone calls. Only candidates selected for interview will be contacted. Notifications to applicants are sent electronically to the email address you provide.